After arches, we were somewhat skeptical about another desert destination (if you missed out on the last post, just think Sandstorm). The desert had proven its ability to be beautiful and challenging in quick succession. We had heard great things about hiking the Narrows (a hike done almost entirely in a stream, with steep cliffs high above on both sides) and figured that hiking in water would offset excessive heat and sandy shoes quite well. Plus, there had be some reason this hike had so much hype. A friend mentioned a hike called Angels Landing which after a quick Googling seemed quite impressive. We decided to change our plans and skip both Capitol Reef NP and Bryce Canyon and go all in on Zion. I’ll go ahead and spoil the surprise right off the bat, we ended up being VERY happy with our decision. I can’t speak for Bryce and Capitol Reef, but Zion provided two extremely epic hikes for us to conquer. We camped comfortably and the park’s shuttle system was a cool way to enjoy the attractions with less crowds thumping around every turn (a real pet peeve of mine). The first real adventure we had in Zion was just making up our own little hike along side of the Virgin River which runs right through the heart of the park. I knew Athena would relish a chance to sunbathe, and the fisherman in me was curious to see if there were any fish swimming about in this desert oasis. It ended up being a lot of fun to picnic on a rock, soak in some sun, stare up at the cliffs and splash around. Athena even fooled me during a jumping off a rock photo op with the classic “1…2…3…Wait!” countdown. As we boarded the shuttle back and talked about a nice relaxing night at the campsite, probably consisting of egregious amounts of s’mores for me, we had a thought. If we could beat the standard park handout’s estimate of 3 hours to hike Angels Landing we could bump our whole schedule and gain a day to spend in Yellowstone and/or Grand Tetons. We checked the weather and it seemed good, maybe going to get windy in the late afternoon, but we had just come from higher winds in Arches- we’d be fine. Fast forward a couple hours, this hike is awesome! Though it had already challenged us with steep uphill switchbacks, it had also presented a few sneak peaks at the awesome valley view that we were anticipating. Somewhat in the back of my mind, and likely Athena’s, we internally noted but did not acknowledge the wind picking up. We continued higher, and progressed through more switchbacks to an exposed overlook which all of a sudden startled us like a slap to the face with intense gusts. We made a turn and tried to ignore what we had just experienced as we now pressed forward into a sheltered area. The distance of this hike was not great but each step was uphill, no lull period whatsoever (this’ll be fun for the knees on the way down). We finally made it to the top though, and the view was gorgeous, however the wind was absolutely howling. We cautiously peeked over a few edges when an arriving fellow hiker informed us that we had not yet summited. We skirted around a boulder and in front of us, mountaintop flora crazily flapping in the wind, was the daunting final leg. Slightly less than a mile of steep grades with a chain handrail staunchly reminded us why the shuttle bus had warned that there had been more than a few fatalities on this journey. The wind put a lump in both our throats. I decided it would soldier on, but was honestly quite nervous. Athena would wait behind at our false summit. It’s kind of impossible to describe the feeling of climbing the last piece, but it was just basically trudging on, staying low, and hanging on for dear life. For any friends who have completed this hike, I can assure you that under normal conditions, I would not be nervous about this piece. This day however, I was legit terrified. I left my shirt with Athena to ensure it wouldn’t puff up like a makeshift parachute and toss me over the edge. When I finally made it to the actual top it was more relief at my survival than a feeling of accomplishment. I took and had taken a few photos with a guy who had made it up before me, and then unceremoniously snaked my way back down to Athena. I ate a banana with her and exasperated, threw the peel over the edge. It was promptly blown back up into the air flew up and over the edge and landed at our feet. Uh oh, we better get outta here before this whole thing blows down. P.S. 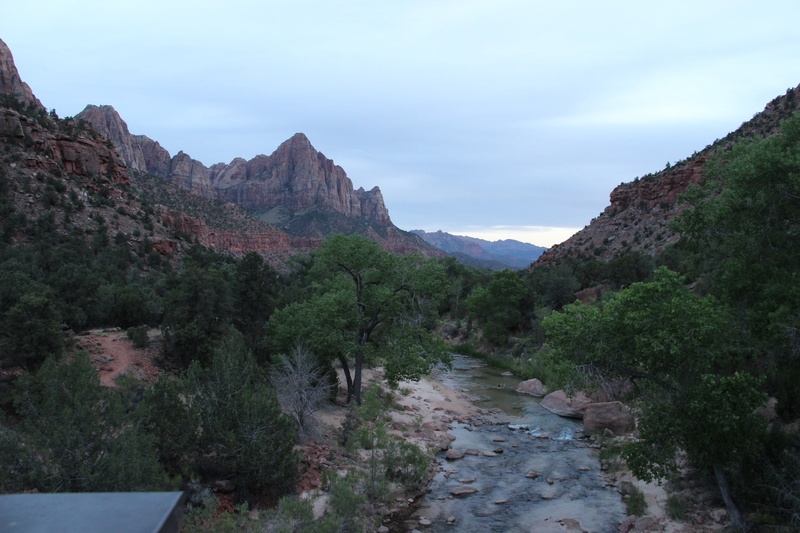 There is a great campground right outside the park- Zion Mountain Campground or something- highly recommend it. If you stay down in the area of site F8, look out for the leaning tree. A sizable tree which our fat asses nearly toppled with our double hammock. Grow some roots tree! Wow u guys look tiny next to these fabulous rock formations! Love u, mom h.